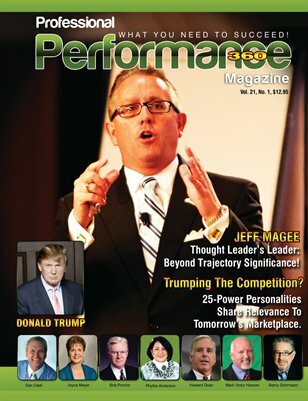 Performance Magazine is a business & success entrepreneurship quarterly, featuring the brightest minds in management, leadership, sales, and performance success. Each article in the magazine has been written exclusively to you, written by business and political leaders who share their knowledge and experience to help you on your path to success. Contributors - Bill Bartmann, Chester Cadieux, Tom Calcagni, Jack Canfield, Dan Clark, Berny Dohrmann, Howard Dean, Steve Epner, Garrett Gunderson, Kent Healy, Cameron Johnson, Harvey Mackay, Jeff Magee, Joyce Meyer, Kevin Preston, Bob Proctor, Howard Putnam, Nolan Richardson, Joe Sweeney, Jim Stovall, Denis Waitley, Alan Weiss, Reesa Wolf, Zig Ziglar, Donald Trump, Chief Phyliss Anderson, Mark Victor Hansen.